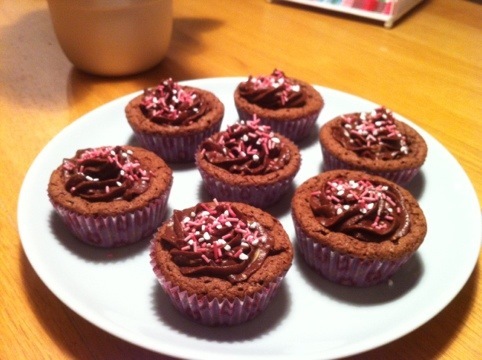 Today when I got home from work I baked some muffins and a when they were cool I had a first try of making cupcakes! I tried a chocolate frosting and sprinkled pearl suger and strawberry sprinkles. After dinner we’ll try them but I’m pretty sure it will taste great because the muffins were very yummy and so was the frosting! 🙂 Obviously these are not good for my diet but you have to spoil yourself a little bit! Oh those are just too cute! I enjoy baking myself, and you are very right! There’s nothing wrong with spoiling ones self while dieting; the main reason diets do not work is because most people cut themselves completely off of sweets. I am rather curious though, how did you make them flat without cutting them?